Our 100% commission real estate agents and brokers in San Francisco are some of the most successful agents in the city and county. Capitalizing on modern technology, they work from home, one of our 1200+ worldwide affiliate office locations, or any other remote location of their choosing. Utilizing our cutting edge Agent Portal™ and transaction management platform, they maintain access to 24/7 broker support, training, marketing, and countless other tools while benefiting from the savings of a 100% commission split. San Francisco is one of the top tourist destinations worldwide, and is the 35th most visited city in the world. Well known for its fog, steep rolling hills, and famous landmarks including the Golden Gate Bridge, San Francisco is also a main banking and finance center. San Francisco is one of the world's top producing cities, and location to more than 30 international financial institutions. 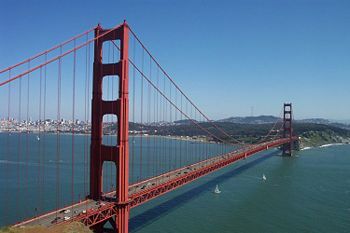 With a population of almost 1 million people, San Francisco has attracted white collar workers from all over the world. The standard of living in San Francisco has increased in recent years, due to a large amount of wealth resulting from the IT and Dot-Com booms from the nearby Silicon Valley. San Francisco property values and household income have risen to be among the highest in the nation, fueling a widely diverse and upscale restaurant, retail, and entertainment scene. According to a 2008 survey, San Francisco has the second highest quality of life of any city in the U.S.
San Francisco is a desirable city in an area full of opportunity, and has a robust real estate market. With its breathtaking views and diverse culture, San Francisco is a wonderful place to live, and an even better place to be a REALTOR®. Over the past few years, however, a large number of San Francisco real estate agents and brokers have grown tired of the high company fees and commission splits they deal with when working at traditional brokerages, and have chosen to take advantage of our comprehensive 100% commission plans. United Realty Group is home to many 100% commission San Francisco real estate agents and brokers. Under our 100% commission structure, our associates in San Francisco keep 100% commission for as low as $125/month + $125/transaction (Silver Plan), or $550/transaction (Gold Plan). As an example, one of United Realty Group's 100% commission San Francisco agents closed a $562k transaction, with a total commission of $14,050. Based on his 100% commission plan, his net check was $13,925! Many of our 100% commission San Francisco agents specialize in luxury properties, short sales, or commercial property, and have strategic partnerships with investors throughout the Bay Area. If you are looking for a 100% commission real estate brokerage in San Francisco, United Realty Group is the brokerage for you. All of our San Francisco real estate agents and brokers are enjoying our 100% commission plans, and most are literally saving tens of thousands of dollars a year in commissions. In addition to United Realty Group's 100% commission plans, we offer 24/7 broker support, training, leads, turnkey marketing campaigns, IDX websites, in-house escrow and transaction coordinating, lifelong residual income for recruiting other agents, MLS access throughout the state, and much more! At United Realty Group, our 100% commission plans barley scratch the surface of all we have to offer. For more information about becoming a 100% commission San Francisco Realtor with United Realty Group, please contact us for a quick response from one of our brokers. Give yourself a raise...start earning 100% commission today!